Troy Dawson Chappell: A Passion for Collecting | Skinner Inc. Troy D. Chappell was introduced to American and British decorative arts through the collections at Colonial Williamsburg more than fifty years ago. His attraction to English pottery, in particular, began in earnest about 1969. His goal was to assemble and contrast pieces to demonstrate most of the manufacturing materials and forming techniques, manners of shapes and colored decorations, and progression of styles that dominated the English pottery trade for the period of roughly 1630 to 1800. He loved the diverse and sometimes subtle ways by which potters and decorators produced their wares and shared that passion with numerous other collectors, dealers and academics. He always said that he collected for the pleasure, for the aesthetics, and to assuage an inner challenge to piece together a historical puzzle in industrial development. It was a personal goal of his to compare a compact mosaic of objects that were available for middle class householders and the lesser gentry during the 17th and 18th centuries in both England and the American eastern seaboard colonies. The collection is basically split into two categories, tin glazed earthen wares and lead glazed earthen wares, with several exceptions. The tin glazed, often referred to as delft, primarily consists of a variety of dishes decorated in both blue and white and polychrome colors, many with rare depictions including a full length portrait of Queen Anne, a landscape with hot air balloon, and a dolphin spouting water with sailing ships in the distance. Other rarities are in unusual forms such as a high heel shoe, a footed punch bowl, a casket shaped inkstand and a covered posset pot. Lead glazed wares are highlighted by examples in translucent enamels and include a variety of table and tea wares, many with press molded bodies. Highlights would include a solid agate cream jug and cover, a landskip sauce boat and polychrome enameled cream colored wares. 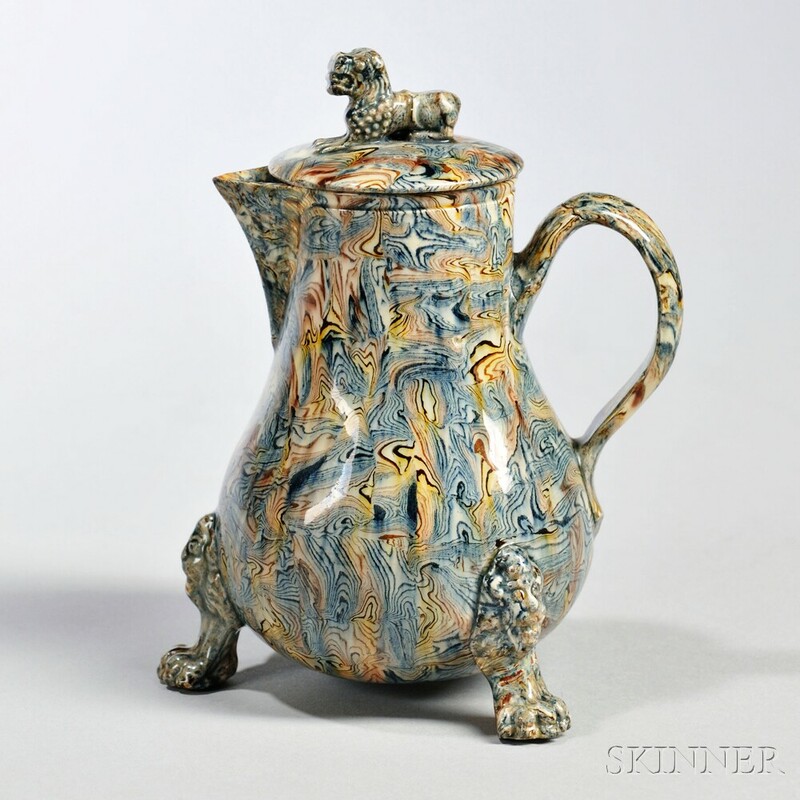 An excellent variety of white saltglazed stone wares round out the lead glazed wares and include molded teapots in forms such as a camel and a mansion, as well as enamel decorated examples of a coffeepot, teapots and large jug. Rounding out Part I of the Chappell Collection will be a nice assemblage of early red ware, stone wares and slip decorated wares. 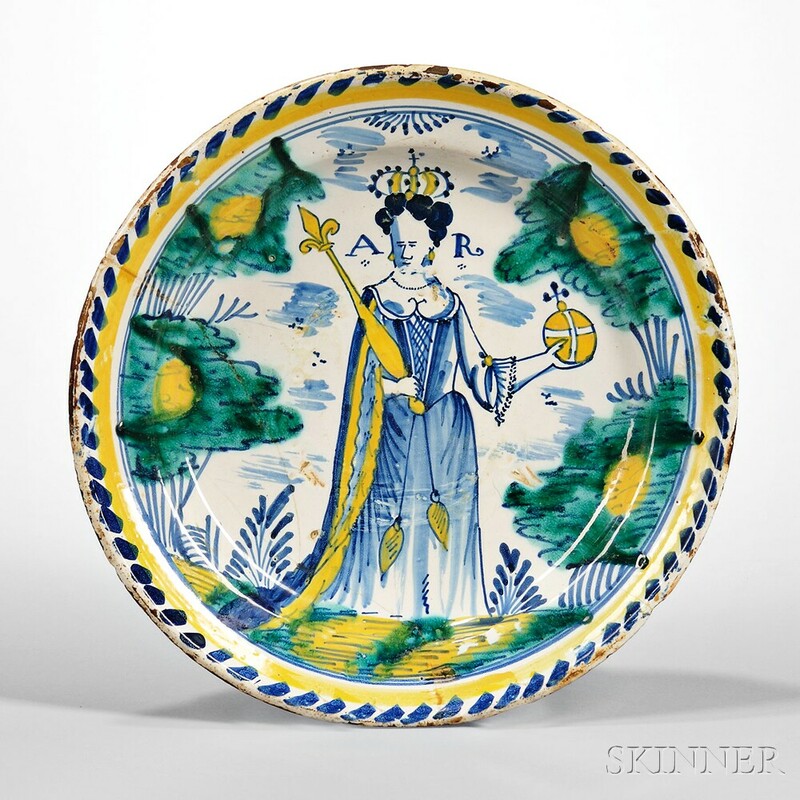 Skinner’s April 8th European Furniture & Decorative Arts auction features Part I of the Troy Dawson Chappell Collection of 17th and 18th English pottery. Part II will be featured in our October auction. This entry was posted in Blog and tagged auction, boston, British decorative arts, ceramics, English pottery, European decorative arts, fine ceramics, lead glazed earthen wares, pottery, red ware, skinner, skinner auctions, stone ware, tin glazed earthen wares, troy chappell, troy d. chappell, troy dawson chappell by Stuart Slavid. Bookmark the permalink.